ye—one who; tu—but; sarvāṇi—everything; karmāṇi—activities; mayi—unto Me; sannyasya—giving up; mat-parāḥ—being attached to Me; ananyena—without division; eva—certainly; yogena—by practice of such bhakti-yoga; mām—unto Me; dhyāyantaḥ—meditating; upāsate—worship; teṣām—of them; aham—I; samuddhartā—deliverer; mṛtyu—that; saṁsāra—material existence; sāgarāt—from the ocean; bhavāmi—become; na cirāt—not a long time; pārtha—O son of Pṛthā; mayi—unto Me; āveśita—fixed; cetasām—of those whose minds are like that. 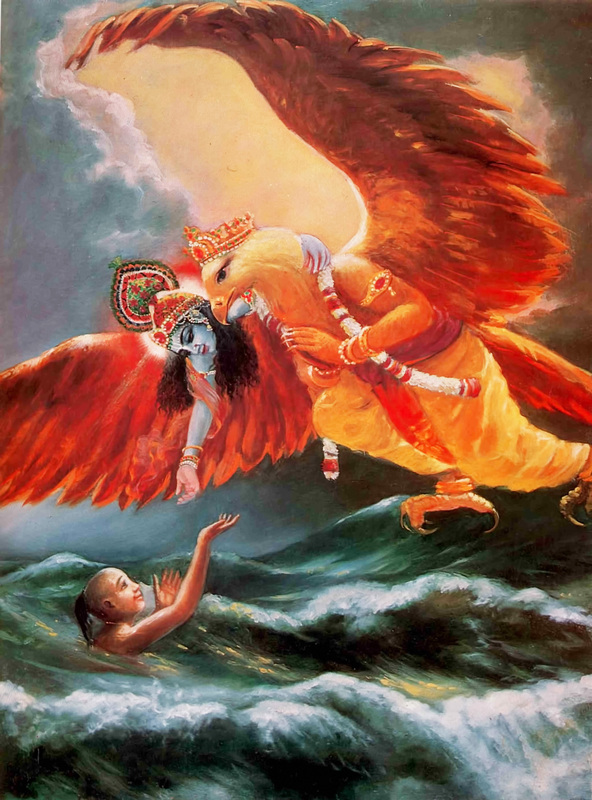 Krsna delivers his unalloyed devotee from the ocean of birth and death. For one who worships Me, giving up all his activities unto Me and being devoted to Me without deviation, engaged in devotional service and always meditating upon Me, who has fixed his mind upon Me, O son of Pṛthā, for him I am the swift deliverer from the ocean of birth and death. It is explicitly stated here that the devotees are very fortunate to be delivered very soon from material existence by the Lord. In pure devotional service one comes to the realization that God is great and that the individual soul is subordinate to Him. His duty is to render service to the Lord-if not, then he will render service to māyā. As stated before, the Supreme Lord can only be appreciated by devotional service. Therefore, one should be fully devoted. One should fix his mind fully on Kṛṣṇa in order to achieve Him. One should work only for Kṛṣṇa. It does not matter in what kind of work one engages, but that work should be done only for Kṛṣṇa. That is the standard of devotional service. The devotee does not desire any achievement other than pleasing the Supreme Personality of Godhead. His life's mission is to please Kṛṣṇa, and he can sacrifice everything for Kṛṣṇa's satisfaction, just as Arjuna did in the Battle of Kurukṣetra. The process is very simple: one can devote himself in his occupation and engage at the same time in chanting Hare Kṛṣṇa, Hare Kṛṣṇa, Kṛṣṇa Kṛṣṇa, Hare Hare/ Hare Rāma, Hare Rāma, Rāma Rāma, Hare Hare. Such transcendental chanting attracts the devotee to the Personality of Godhead. Simply by chanting the holy name of Kṛṣṇa-Hare Kṛṣṇa, Hare Kṛṣṇa, Kṛṣṇa Kṛṣṇa, Hare Hare/ Hare Rāma, Hare Rāma, Rāma Rāma, Hare Hare-a devotee of the Lord can approach the supreme destination easily and happily, but this destination cannot be approached by any other process of religion. ahaṁ tvāṁ sarva-pāpebhyo mokṣayiṣyāmi mā śucaḥ. One should give up all other processes of self-realization and simply execute devotional service in Kṛṣṇa consciousness. That will enable one to reach the highest perfection of life. There is no need for one to consider the sinful actions of his past life because the Supreme Lord fully takes charge of him. Therefore one should not futilely try to deliver himself in spiritual realization. Let everyone take shelter of the supreme omnipotent Godhead Kṛṣṇa. That is the highest perfection of life.